Stock photo of railway tracks at Morant's Curve alongside the Bow River, Bow Valley Parkway, Banff National Park, Alberta, Canada. Banff National Park forms part of the Canadian Rocky Mountain Parks, UNESCO World Heritage Site. Railway tracks at Morant's Curve alongside the Bow River in Bow Valley Parkway, Banff National Park. 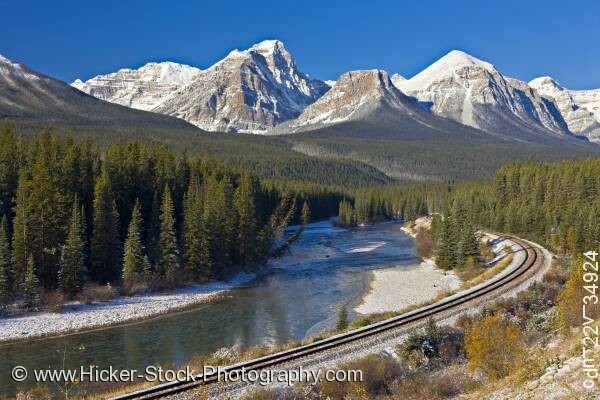 This stock photo shows the scenic view along the railway tracks at Morant's Curve alongside the Bow River, Bow Valley Parkway, Banff National Park, Alberta, Canada. Banff National Park forms part of the Canadian Rocky Mountain Parks, UNESCO World Heritage Site. The railroad tracks run along the Bow River with an awesome view of the Canadian Rocky Mountains and the tall slender evergreens that surround the river. The grand snow covered mountains dominate the scenic view along the Bow River. The sun shines on the mountains reflecting the snow throughout the crevices and ledges of the Rocky Mountains. The railroad tracks curve around the river and disappear into the heavily wooded forest. Railway tracks at Morant's Curve alongside the Bow River, Bow Valley Parkway, Banff National Park, Alberta, Canada. Banff National Park forms part of the Canadian Rocky Mountain Parks, UNESCO World Heritage Site.